Your home entertainment system doesnâ€™t need to be only indoors. Extend the fun outside! Outdoor entertainment systems are good to have during barbecues, pool parties, birthday parties, or any gathering which youâ€™re planning to hold in your yards. Outdoor speakers give life to any party especially if they produce the best sound. They donâ€™t need to be hidden in your eaves or set up in the most secluded place just because it doesnâ€™t match the dÃ©cor or color scheme of your home. Outdoor speakers are available in a variety of decorative options like decorative rocks, planters, lanterns, fountains and even yard animals. They can be wired and wireless, small to large and of any color you want. One of the most popular audio formations are rock speakers that come in different sizes and prices depending on how big the space you need to fill. These rock speakers can be placed somewhere in the patio, around small to large yards and even around the pool. Wireless speakers let you enjoy audio in your backyard or patio with ease and convenience. You donâ€™t need to run cables or wires, you can place them in the perfect spot without any trouble at all and you can easily put them inside for storage during a bad storm or just for security of your belongings. They come in various designs and sizes and they are complete with everything you need including a mini adaptor cable that hooks up to the transmitter and then to your mobile device or music player. 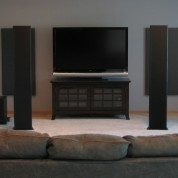 Outdoor audio is about having fun and getting the best audio system perfect for open spaces. You can combine technology with art at the same time to match your yardâ€™s theme and to add more beauty around your garden. With so many designs to choose from â€“ frogs, birdhouses, rocks, and even life-sized German shepherd â€“ you are sure to impress your guests when you tour them around your place. Check out more interesting and affordable outdoor speakers from Active Networks â€“ one of Californiaâ€™s leading providers of Audio & Video sales and services. This site was... how do you say it? Relevant!! Finally I\'ve found something that helped me. Thanks! What\'s Going down i\'m new to this, I stumbled upon this I\'ve found It absolutely useful and it has aided me out loads. I\'m hoping to give a contribution & aid different users like its aided me. Good job. Welcome to our site: wholesale michael kors watches . What are you still waiting for? jordan 4 outlet jordan bred for sale - air jordans retro iv shoes online black friday sale, cheap cement black|militay blue|fire red|3 88 styles wholesale price! Nice post. I was checking constantly this weblog and I am inspired! Very useful info specifically the last part : ) I take care of such info much. I used to be looking for this particular information for a long time. Thank you and good luck. A one star rating is usually a feature Netflix thinks you\'ll not enjoy in any respect while five stars means Netflix thinks you are going to love it. Wow that was unusual. I just wrote an really long comment but after I clicked submit my comment didn\'t appear. Grrrr... well I\'m not writing all that over again. Anyhow, just wanted to say great blog! Nice post. I was checking constantly this weblog and I\'m impressed! Extremely useful info specifically the ultimate part :) I handle such info much. I was seeking this certain info for a long time. Thanks and best of luck. It\'s an awesome post designed for all the internet viewers; they will get advantage from it I am sure. Hello! I know this is kind of off topic but I was wondering if you knew where I could find a captcha plugin for my comment form? I\'m using the same blog platform as yours and I\'m having trouble finding one? Thanks a lot! Great post. I was checking constantly this blog and I am impressed! Extremely helpful info specially the last part :) I care for such info a lot. I was seeking this certain info for a very long time. Thank you and good luck. Thanks for another fantastic article. Where else could anyone get that kind of info in such an ideal means of writing? I've a presentation next week, and I'm on the look for such info. What's up to every body, it's my first pay a quick visit of this weblog; this webpage carries amazing and in fact good information in support of readers. Very nice post. I just stumbled upon your blog and wanted to say that I've truly enjoyed surfing around your weblog posts. In any case I will be subscribing for your feed and I hope you write once more very soon! Good day! I simply would like to give you a big thumbs up for the great info you have got right here on this post. I will be returning to your website for more soon. Thank you for the good writeup. It in truth used to be a amusement account it. Glance advanced to more brought agreeable from you! By the way, how can we communicate? It's an amazing post designed for all the web people; they will take benefit from it I am sure. This is a good tip especially to those new to the blogosphere. Simple but very precise info… Thank you for sharing this one. A must read post! Your method of explaining everything in this post is in fact pleasant, every one can without difficulty be aware of it, Thanks a lot. What's up, of course this post is genuinely fastidious and I have learned lot of things from it about blogging. thanks. Hello friends, fastidious article and good urging commented at this place, I am genuinely enjoying by these. Hi there everyone, it's my first pay a visit at this web page, and paragraph is truly fruitful in favor of me, keep up posting such content. Valuable info. Fortunate me I discovered your website by chance, and I'm surprised why this coincidence did not came about earlier! I bookmarked it. obviously like your web-site however you have to check the spelling on several of your posts. Several of them are rife with spelling issues and I find it very troublesome to tell the reality on the other hand I will certainly come again again. Qp3y3p Merely wanna say that this is very helpful, Thanks for taking your time to write this. I have read so many articles or reviews concerning the blogger lovers except this paragraph is really a nice paragraph, keep it up. Y4E7YG I really liked your article.Really looking forward to read more. What's Happening i am new to this, I stumbled upon this I have discovered It absolutely helpful and it has aided me out loads. I hope to give a contribution & help different users like its helped me. Great job. Thankfulness to my father who told me on the topic of this blog, this webpage is actually awesome. My partner and I stumbled over here coming from a different web address and thought I should check things out. I like what I see so now i am following you. Look forward to looking into your web page for a second time.